Goat people will try hard to hide their origins. They walk lightly and pad their footing. They'll never go out dancing with you, no matter how much you beg them. Where did these goat people come from? Well, historically they're supposed to be from hell. We're not going to judge though. They could be from anywhere. Maybe they're just mountain people who evolved to be really good at rock climbing. That should be a good thing, right? 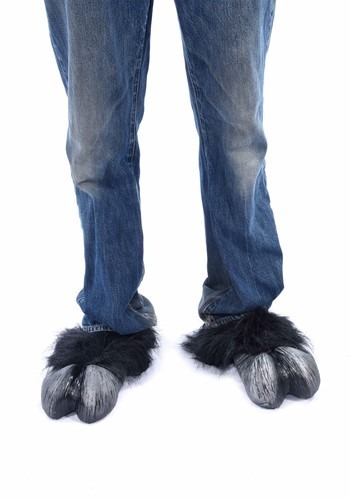 This Halloween, make the goat people around you feel comfortable flaunting their sheepish origins when you slip into these costume goat feet! These furry hooves are sure to be a hoot when you add them to any ensemble. With latex hooves and faux fur backs, they simply secure onto your shoes with elastic. Hoofing it has never been easier! Whether you're dressing up as your favorite farm animal or your intentions are a little more devilish, these feet are sure to be the perfect finishing touch to your ensemble. Now, if only you could figure out how to climb boulders like a billy goat! If you're going to try it, you'd better wear climbing shoes under these hooves!